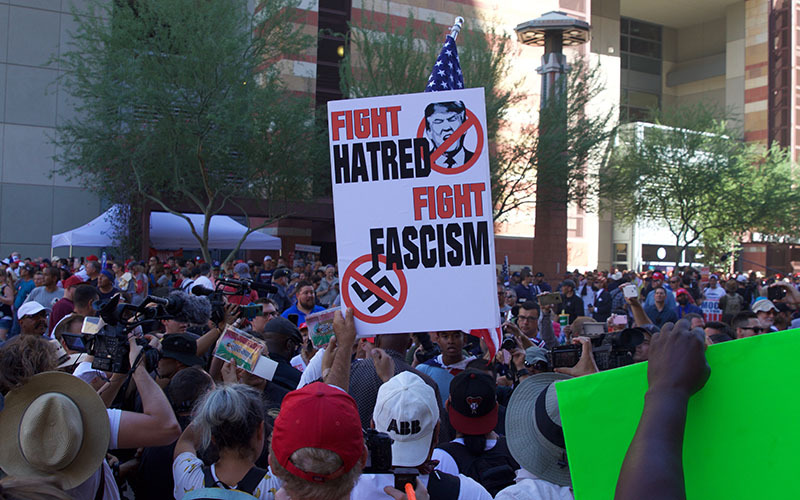 PHOENIX – A year after Phoenix police fired tear gas and pepper-spray bullets at a crowd protesting President Donald Trump, the ACLU, two advocacy groups and several protesters have filed a lawsuit claiming police used excessive force and repressed free speech. Police “indiscriminately fired harmful pepper spray, gas, pepper bullets, and flash-bang canisters into the assembled crowd, which included children, elderly people, disabled people, and pregnant women,” says the class-action lawsuit, filed in U.S. District Court of Arizona against Phoenix and Police Chief Jeri Williams. The suit names the ACLU Foundation of Arizona, activist organizations Puente and Poder in Action, and four Trump protesters as plaintiffs. It was filed Sept. 4. “The failure of the Phoenix Police to warn the peaceably assembled crowd of the coming attack, as is required by the Constitution, and to provide for a safe dispersal route for the protesters to avoid the police onslaught, guaranteed the ensuing widespread panic and fear amongst those assembled and resulted in physical and emotional injuries, as well as constitutional violations,” the lawsuit says. 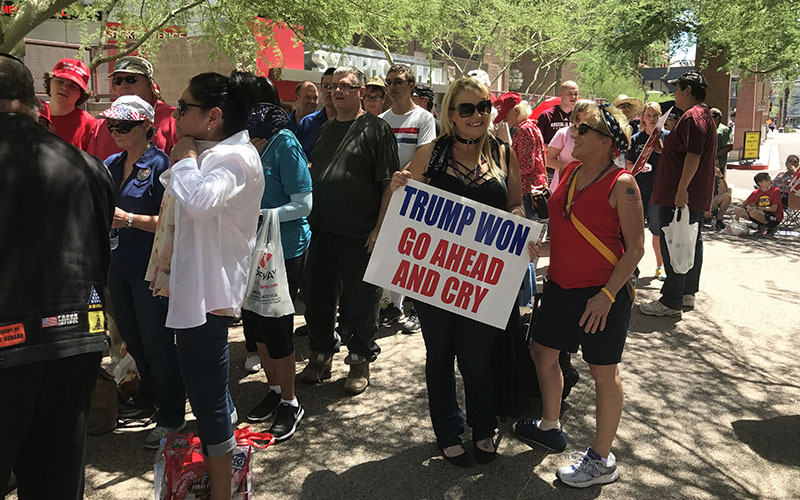 Thousands of Trump supporters and opponents descended on an Aug. 22, 2017, rally at the Phoenix Convention Center last year, with tensions heightened because of violence that had erupted a week earlier at an alt-right rally in Charlottesville, Virginia. The trouble in Phoenix started after the rally ended, with police saying they were forced to use tear gas and projectiles after some protestors threw rocks and bottles and refused orders to disperse. 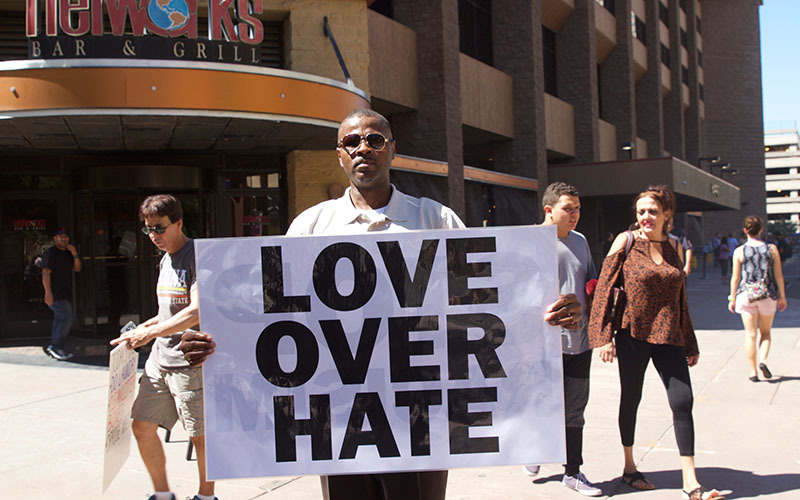 Chief Williams and then-Mayor Greg Stanton praised the police response at a news conference later that night, saying officers responded appropriately to chaos caused by a few demonstrators. But pushback erupted on social media and spread to a contentious public meeting a few days later at City Hall. 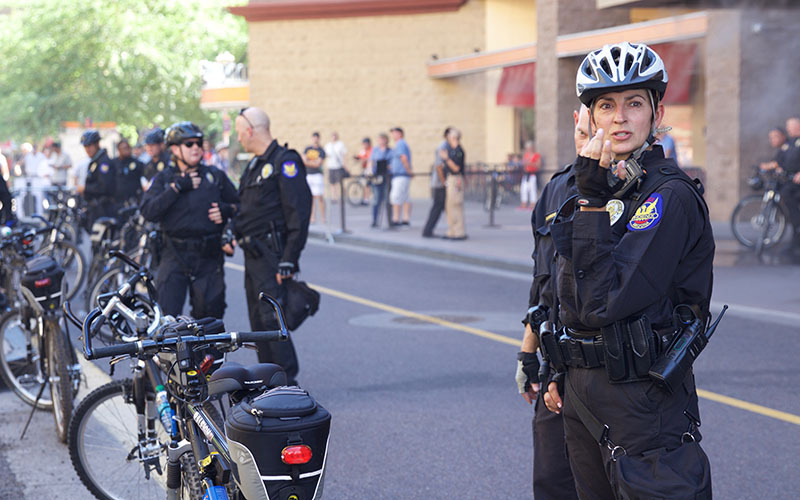 The public outcry prompted Phoenix to launch an independent report evaluating the way police handled the August protest. The report found that police could have better communicated with demonstrators, and it found that police fired tear gas canisters 17 minutes before issuing their first warnings to the crowd. Miscommunication between police and protestors is crucial to ACLU’s case, said Cindy Pànuco, an attorney with Hadsell Stormer & Renick, the Los Angeles law firm that’s litigating the suit with the ACLU, told Cronkite News the case was filed after receiving records, such as police body-cam footage and internal communications from Phoenix police the night of the protest. “You cannot disperse an unlawful assembly without having justification and first determining if there was an unlawful assembly,” she said. Police “could not under the Constitution and under their own policies have used the force that they did without first warning protestors and asking them to disperse,” Pànuco said. The lawsuit says officers fired nearly 600 projectiles into the crowd that night. The independent report also stated a small number of members of far-left groups collectively known as Antifa incited the chaos that prompted the police to act immediately. “They punished the actions of many for about four people while largely admitting that the crowd was peaceful,” Pànuco said. In the lawsuit, the four plaintiffs describe inhaling pepper spray, being hit with projectiles and needing medical help. Jacinta Gonzalez Goodman, one of the plaintiffs, said in an interview that she was at the event with Puente Arizona, Mi Familia Vota and other advocacy groups when police fired the first round of pepper spray bullets. The trauma lingers, she said, and the clash has intimidated activists who regularly attend protests for social causes. “We don’t believe the cops should be used that way to repress opinions and thoughts,” she said.